There are quite a few chores that your preschooler can do. 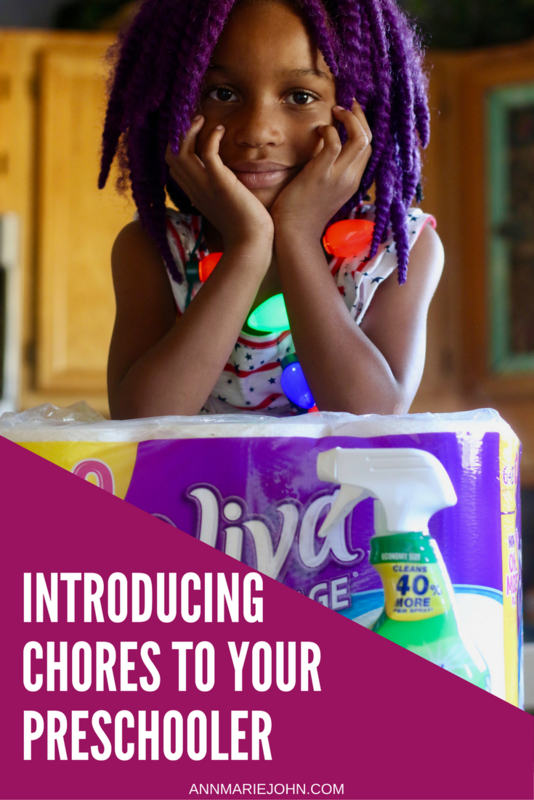 After all, they love making messes, so it's time that they're put to work on cleaning those messes, with the help of Viva Advantage paper towels and Clorox Clean-Up. Madison at the age of 5 can understand more than the average 2-step command, and so can most preschoolers. However, she can also make a mess faster than Superman can fly. I have been introducing chores to her gradually, because personally, I don't want a child so lazy and dependent on me that when she's older she can't do anything for herself. With that being said, I don't expect her to prepare a 5 course meal, because obviously that's not going to happen, and I also don't want her burning the house down. There are, however, various chores that she can do, and if you have a pre-schooler on your hands, I'm going to share a few of them with you. There are also a few things you want to also keep handy when it comes to preschoolers, and I would have to say all children in general. 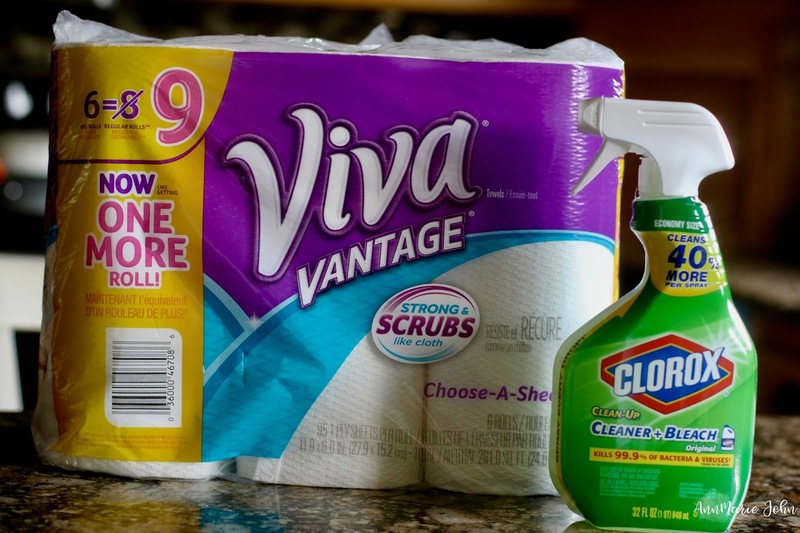 When it comes to cleaning supplies, I rely heavily on Viva Vantage paper towels and Clorox Clean-Up. I know that they can get the job done. 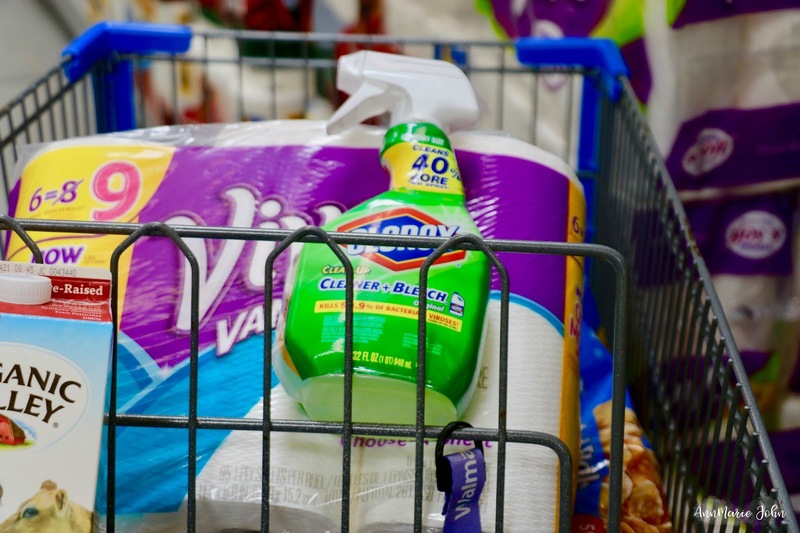 Viva wipes up all the spills and messes and Clorox keeps all those nasty germs away. So here are 4 tips when introducing chores to your preschooler. Prepare a chore list chart and have your preschooler follow the chart. Don't give in! Preschoolers love to work on your heart strings, so you may have to be firm. Give specific instead of general instructions. For example, instead of saying "pick up your toys", say "put your toys in the toy box". Giving clear and concise instructions can prevent the pitfalls of misinterpretations. Everyone loves praises and kids are no exception. Let them know what a great job they're doing and have done, even if you don't think so personally. Giving praises while they're working may even encourage them to do more. No-one's perfect and expecting perfection from a preschooler is like expecting me to know how to perform brain surgery. It's not going to happen. Instead once again give praises for what they have done. One more thing to note is that if you're going to jump in and take over the job, because they're not doing it the way you think it should be done, this defeats the entire purpose of having them do the chore in the first place. Here are 10 easy chores your preschooler can do. I always stock up on my Viva and Clorox products whenever I make my Walmart shopping run. 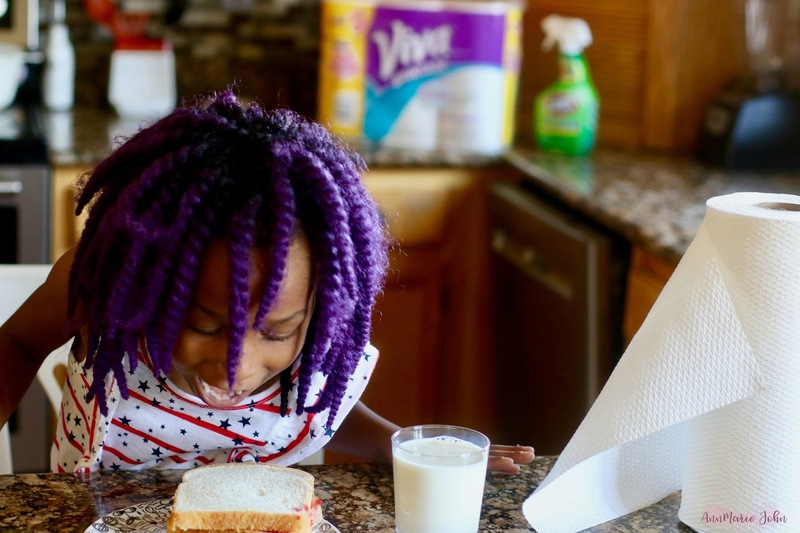 With kids in the household, paper towels are usually the first to go and Viva Vantage paper towels are exceptionally strong and takes care of the messes the first time. I love their select a sheet option, as you only need a small sheet for a small mess. Clorox on the other hand has always meant clean, and whether it's my bathroom or kitchen, I always keep Clorox nearby. 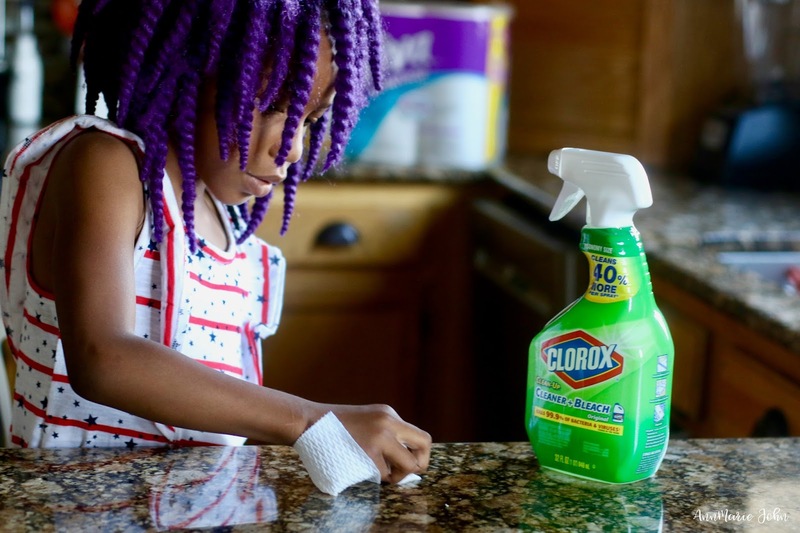 Clorox Clean-Up kills up to 99.9% of bacteria and viruses, and with children around who still goes from hand to mouth, knowing that my surfaces are clean is a bonus. Thank you Clorox! So stock up on your own Viva Vantage paper towels and Clorox Clean-Up products and get cash back with Ibotta rebate offers. These are all great ideas. We've had our kids doing chores since they were old enough to pick up things. It's important to teach the value of helping and of work. I love this. I think it's key to teach the kids about working and being a helpful part of the family as early as possible. There are so many chores that kids can do, as well as can help adults do. Whenever you are doing a chore like washing dishes, or washing a car, giving the child a sponge let's them feel like they are helping (even when they aren't actually helping). It is so important to have kids helping around the house and doing chores. This is such a great idea, I need to get my kids in better habits this summer of doing their chores. Growing up I was always taught the importance of discipline, which included cleaning and maintaining my own personal items. I'm always looking for other ways to have my sons help around the house, this was super interesting, thanks for sharing! I am all for putting them to work around the house from a young age. I did that with my kids and it's good skills for life. It's definitely nice when everyone contributes to the house chores. There are plenty of simple things the kids can do. I think your tips are great! I think it is really important to teach your children chores early. It helps them develop responsibility. I definitely agree kids should learn how to help around the house. I think boys should be taught the same things, so it's not all on the women! Equality in chores helps so much. We've been teaching our 3yo to clean up spills with paper towels. He's super into cleaning right now, so we also let him sweep and vacuum. We usually have to do a once-over after he's done, but he's learning! Excellent chore suggestions! I am all for kids helping out around the house since it instills excellent work ethic and responsibility. They tend to feel accomplished once they complete their tasks too. I so agree, having kids helping out around the house is a great way to prepare them from a young age. my mom would always have us doing small things here and there. i appreciate it so much now. These are the same chores I gave my toddler to do. It is such a huge help. I am glad that you gave the important advice before you gave the chore ideas. I am in the middle of teaching my 3 year old how to get more involved in chores. I have him putting untensils away right now. I agree that kids need to help out more. My youngest son absolutely loves to help out. Chores can be meaningful if not assigned in excess. Ohhh, she's pretty great! 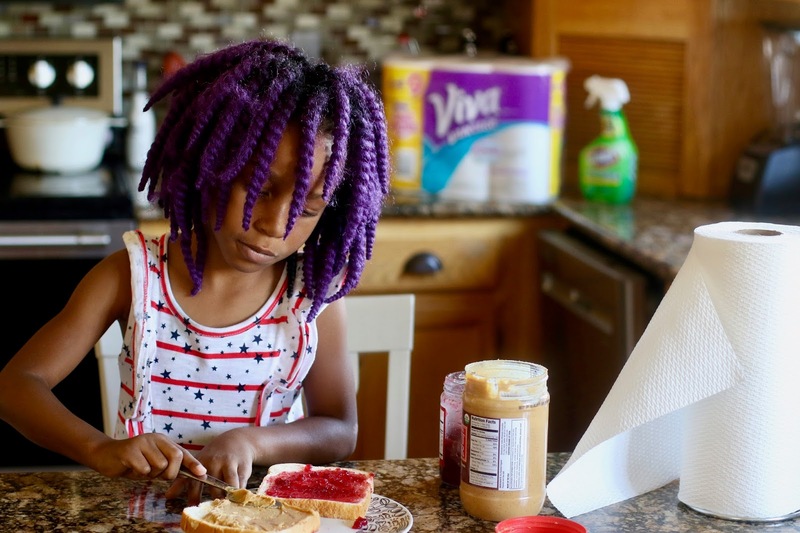 Scarlet is just starting to make her own sandwiches and fix her own yogurt. Des has decent cleaning skills but they've only developed in the last few weeks. I will certainly use your tips! My girls love the responsibility of cleaning up after themselves. It teaches valuable lessons. My three-year-old's room was always a mess. I went out and bought new organizational supplies, thinking that would fix it. All I've done is making it easier for her to find her toys and make a mess. It's time to start working on chores with her so I don't go crazy. There really is a lot of chores for preschoolers, I remember starting each of my kids off around age 2 helping around the house. Basically if they could walk ... then they could help :) This is a great list of chores your preschooler can do along with tips, I believe in praise and being clear/specific in instructions - helps to alleviate frustration of both kiddo and parent! These are such great tips! There really is so many productive things even the little ones can do, and it only helps them to be this way as they get older! Love this post! My niece and nephew are pretty good at picking up their toys and helping out. Though they seem to slack a bit when Aunt Blythe visits, but I still try to lay down the law, in a nice way of course. I think it's great to get kids started early with chores. If you make if fun and give them rewards or praise, they just might keep up the effort as they get older. We often have Viva and Clorox Spray in the house. Your list is consistent with mine, pretty much, for what the kiddos can do at her age. I had my youngest (9) make me and him lunch last week (for my work and his day camp). He did great with mine, putting in the healthier items I usually pack. I opened his lunch box to see what he'd packed for himself and it was a small box of Froot Loops and a juice box. I don't think so, lol!! This is great! My little preschoolers love to help clean and do little chores. I let them wipe off their little play table or help windex the glass coffee tables. Also picking up toys and cleaning their room. They love doing laundry and trying to fold. Haha! I love seeing other moms empowering and teaching their kids that they can help themselves. And dang girl - your kitchen is so clean!!! This is such an awesome list! There are so many parents today who want to shield their kids from chores... but that just creates lazy and entitled adults. I'm so glad to see someone out there is teaching their kids about family and community participation as well as the pride of responsibility. This is a great reminder - I have to work on #4 - I always want things done right and then just do it on my own, but I know my littles wont learn much that way! Thanks! These are great chore suggestions! I have two pre schoolers and have started to get them to help around the house! I love tough rags to clean with. I also love when my children clean. Chores like these are so simple yet start teaching these young ones responsibility early. I think you have compiled a great list of chores. So the trick is to make cleaning fun for the kids lol I agree definitely praise them! I think it is so important to instill a sense of responsibility in children from a young age. After all, we are raising them to one day be self-sufficient and being able to take care of a home is an important part of being an adult. These are great tips! I definitely believe in staying consistent with kids. They are able to help clean up at young ages-- remember singing the clean up, clean up, everybody clean up song? Yup, start them young! My six year old has been doing most of these chores for a couple of years. It's harder to get the 3 1/2 year old to help out with them, though! These are wonderful tips! It is very important to help the kids grow up and one of the ways to do that is through home routine. Preschoolers actually like to help around the house. I have a classroom full of little helpers :) Your daughter is gorgeous - how photogenic!